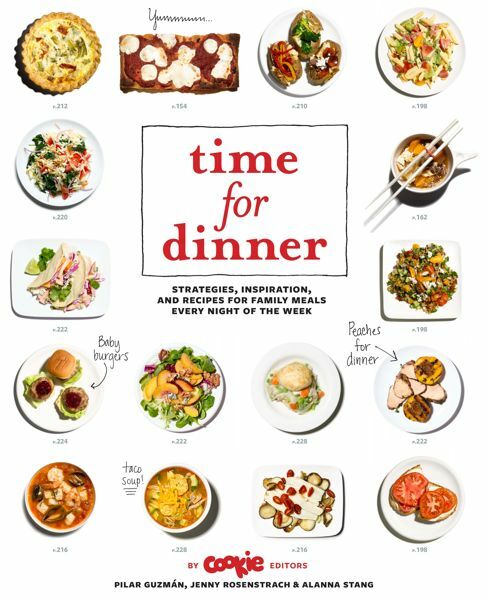 A few notes on Time for Dinner — besides the fact that it was selected as a favorite cookbook of the year by Bon Appetit, and besides the fact that you are all scooping up multiple copies to give as gifts for all your parent friends. I want to talk about the New York Times including TFD in their special Holiday Books Round-up yesterday, specifically this part of the review (by Christine Muhlke) that, I think, totally nailed it. The lack of preciousness was a plus. So were all the pictures, since, my friend said, “you usually have half a minute to think about what to cook at 6:30 while your kid is crying and it’s really already too late to start cooking dinner, but you feel bad that you’re serving pasta with butter the fifth day in a row.” She shouldn’t worry. As the editors write, “If there’s food on the table and everyone is eating it, call it dinner.” Now say grace. You know by now how gorgeous the photos are in the book (thank you, Marcus Nilsson) and presumably you know how important good photographs are to inspire the grown-ups to run to the stove and start simmering. But how about what it does for the kids? For a while there, during the dark days of Abby’s Noodles Only phase, I would hand her cookbooks and ask her to pick what she wanted. This act was enough of an investment to convince her to take a few bites. (Neither of us had the patience to cook things together at this point.) I always dreamed of creating a photo gallery of dinners inside a cabinet door, Chinese Menu Style, so the kids could just point to what they wanted and we could get cracking. The cover of the book was designed with this strategy in mind, so for those of you who own the book already, show it to your kids today. Maybe they can pick tonight’s dinner. Congratulations!! That’s so exciting for you guys. Love the book…will try the strategy with my kids. I am giving the cookbook to a few well chosen friends who I know will really appreciate it! Congratulations of your beautiful book. I can’t wait to see it. When the baby wakes up early and when the baby wakes up my 4 year old we all go downstairs and look at cookbooks while waiting for the sun to come up. Again, congratulations on this huge achievement. Congratulations!! That’s so exciting for you guys. I couldn’t love Dinner: A Love Story more. I’ve been singing its praises to everyone I know… Hope all is well! Your book is reminiscent of Usborne or DK books. Years ago, when my children were young, I spent many happy hours poring over this kind of book with a child in my lap. It’s a perfect format for a cookbook!